Sheffield Eagles have completed the signings of prop forward pair Rory Dixon from York and Lewis Taylor from Hemel. Both have agreed one-year deals, and their arrival takes director of rugby Mark Aston’s close season recruitment count to 12. Dixon, 20, who also enjoyed a loan move to Hemel last season, has experience of playing in Castleford’s academy, whilst Taylor initially came to prominence though the university system before taking the opportunity to join the Stags. 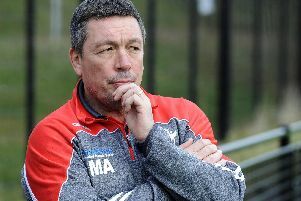 Aston’s connections with former dual-registration partners Hemel have again come to fruition, with more signings expected before the end of the week. Aston said of Dixon’s arrival: “This kid has been at Leeds and come through the system there. He had an opportunity to sign for Leeds or sign for Cas - and he signed for Cas. “I watched his clips and I looked at him and thought that this kid has got a bit of something. He has played at Hemel so I spoke to Jack Howieson (Hemel coach), and he reaffirmed what I thought. He has got something, he is only young but I think in two, three four, five years, if he keeps progressing, I think he'll be a really good player. Whilst both lack in experience, it is their potential that Aston has bought into, especially in Taylor’s case who is still very much in the infancy of his rugby league career. After converting from rugby union, Taylor initially caught the eye playing for Loughborough University, with recognition following with a call up to England’s 2018 University Rugby League squad. He joined Hemel, gaining experience in League One, and Aston has seen enough to suggest there is room for further development. He's a young kid from Devon who has also played rugby union,” Aston said. “He came up to Loughborough University and played in the university system for a while.